I moved the forum to a another server tonight. It used to be on a dedicated host, which makes setting up Discourse (our forum software) easier. After it has been running there smoothly for a couple of weeks, it was time to move it to the main server and put it live behind an nginx proxy. So far it appears to be working fine. 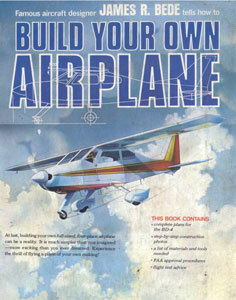 This work is based on “Build Your Own Airplane” by James R. Bede. The table cross references part numbers to the drawing where the dimensions for that part are defined. It is based on a recent edition of the book. There may be omissions and/or errors. Most of the information in this table was contributed by Dave Arnholt. To print this page use this PDF document. These are the numbers that are in a hexagon on the drawing. Callouts are on page 142. This is the base material. You also need to be aware of the hardness or other properties called out in the drawings. This is not the maximum dimension of this piece – see drawing. These are the numbers in rectangles on the drawings. Click here for a cross reference between the hex number and the associated Bede Part numbers. I got curious about what the exact differences between the plans and the book drawings were, so I compiled a list showing what is the same and what s different. I have attached it as an Excel spread sheet. I can’t guarantee there aren’t any errors. Some of the print is hard to read. Both were purchased from Jim Bede in 2000. NOTE 2: SOME DATES WERE NEAR ILEGABLE AND I MADE THE BEST GUESS THAT I COULD. ALSO, THE PLACEMENT OF THE MODIFICATION BLOCK VARIED AND IT IS POSSIBLE THAT I MISSED ONE OR TWO. NOTE 3: SOME OF THE 1976 DATES MAY BE 1970 DATES. THE ZERO HAS A LINE EXTENDING ABOVE AND I INTERPERETED IT TO BE A SIX. OTHERS WERE CLEARLY A SIX. NOTE 4: DATES ARE DIFFERENT BUT NOTES ON REVISIONS ARE THE SAME. THE BLUEPRINT (PLANS) LOOKS LIKE THE DATE MAY HAVE BEEN CHANGED FROM 70 TO 76. (Ed. : I marked the lines where the book differed from the plans with yellow). 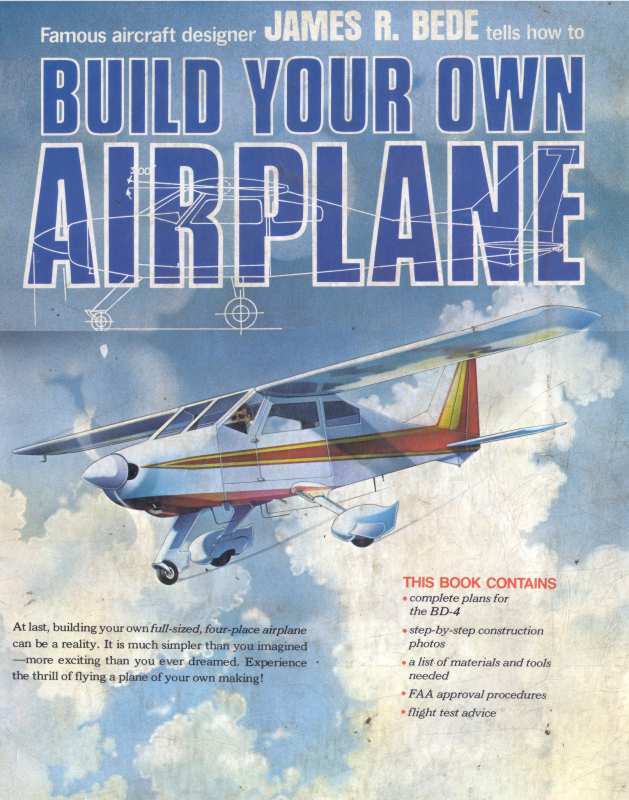 This book is still the No.1 source of information when you build the plane. It contains building instructions and a full set of plans at a smaller scale. The drawings are somewhat more up-to-date than the full-sized plans. See the revision page for a detailed comparison. You can buy the book and the plans from Bede’s current company. Refer to it’s homepage. Q: Is the BD-4 a true 4-seater? A: Only with the one of the fuselage modification. With the original configuration, the back seats are for small people. Tall people will fit too but it is rather snuggly (see this picture, this is an unmodified fuselage). I’ve flown on trips on the back seat and found it to be quite comfortable when I had the bench for myself. A number of BD-4s have consistently shown up at the fly-ins with four people on board. Q: Can the BD-4 be built from plans? A: Yes, and there are a number of flying BD-4s that were build from plans. The material for most parts can be purchased from regular sources, and of course from the Bede Corp. Some parts have to be welded. If you can’t do it yourself there are other builders who can help you out. Note that the BD-4 was sold as a kit and the plans assume you have received all parts and don’t go into much detail how to acquire and build from the raw material. This website is trying to fill in here and the builder’s community is pretty good with giving answers when questions arise from reading the plans. Q: How fast is the BD-4 really? A: This greatly depends on the configuration. Factors such as power plant, landing gear configuration (tricycle or tail wheel), fairings, a rounded windshield let the cruise speed vary between 140 MPH and 200 MPH. Expect 140 MPH (or even less) with a 150 HP engine, a tricycle and little to no fairings. Expect 180 MPH (or even a little faster) with a IO360, wheel pants, the rounded windshield and everything neatly faired in. There are sample BD-4 flying with a fuel efficiency of around 20 MPG. This is rarely beat by other 2+2 seaters. Q: Is the BD-4 all metal? A: The fuselage and empennage is metal. However, the original kit had composite wings. These composite wings very often suffered from leaking fuel cells. A lot of builders have built metal wings. Some purchased the “Murphy Wings”. TVAP’s sells wing kits for around $5,000. You can buy metal ribs from Dream Aircraft and D&E Aircraft Services. Together with the spars from Dream Aircraft (see supplier page) and sheet metal you can build your own wings. Bede’s plans contain drawings for metal wings. John Raffensparger also sells plans for metal wings. Q: Which engine can I use? A: The BD-4 is one of the most versatile designs, especially in regards to the power plant. It has been flown with numerous certified and other engines (i.e. autoconversion engines). The engine of your choice should not have less than 150 HP. The most commonly used engine it the Lycoming IO320 and IO 360. But there are quite a few with Ford V6 auto engines. For engines much heavier than the IO360 a fuselage stretch might be in order. Q: Is it advisable to buy a 20 year old project? Any age related issues to be considered? A: This depends on the project. Generally the parts don’t fall apart over time. However, do look for corrosion. I’ve heard of a project where mice have nested and their urine weakened the fuselage skin to an extent that one could poke through it with the bare finger. Others have reported corrosion on the inside of the wing spars. If the windows are build of Lexan they will probably have to be replaced. If the composite wings are already assembled check for fuel leaks (and ask how the builder treated the fuel cells). Also, a really old project might miss some of the numerous modifications. I personally bought two 20 year old projects. The one was an unfinished project. The parts are in a very good shape. Some corrosion but nothing to worry about. The second was a plane that has been flown over 1200 hours. The fuselage is in an excellent condition. When you consider buying an unfinished project be real careful to uncover building mistakes. Q: How much fuel will fit into the tanks? A: The fuel cells are located in the wing (wet wing design). The size of the tanks depend on how many sections (in between two ribs) you want to flood. A section fits about 7 gal. Most builders use 3 to 5 cells for each wing (equaling app. 40 to 80 gal total). But there are others that use more (up to the 100 gal. ofJim Huber‘s plans built plane). Q: What is the useful load for the BD-4? A: This depends on two factors: empty weight (1,200 lbs ~ 1,500 lbs) and gross weight. Latter number in turn depends on which wing and center spars you use and how long your wings are. The weakest link with long wings and the original spars are the wing spars (not the center spar). In this configuration gross weight is 2,200 lbs or less to remain within the utility class. If you use the spars from Dream Aircraft you may increase the gross weight to max. 2,500 lbs. In addition to the wing spar, for a high gross weight the stability of the landing gear is also of concern. With a beefed up landing gear (Bede’s modifications call for this) a gross weight of 2,500 lbs seems unproblematic. Thus, in case you shoot for a high useful load you can achieve around 1,000 lbs (including fuel). Q: I heard the landing gear is too weak. How can one beef it up? A: Both the landing gear box and the gear should be modified to handle the additional weight of nowadays BD-4’s in relation to the original BD-4 of 1969. There are various articles in the newsletters how to beef up the landing gear box. The original landing gear is soft and tends to sag. Again, the newsletters discuss several fixes. You may also buy a ready-to-go-in landing gear from Dream Aircraft. Q: Is the BD-4 hard to fly? A: No. However, it has a rather high stall speed if the original (short) wings are used. You can improve the stall speed by having longer wings, extending the chord length of the flaps by about 2″ and enable a 40% flap setting. Q: I’ve heard the BD-4 is an unsafe aircraft because there have been many accidents that were caused by fuel starvation. Is this true? A: It is true that there have been accidents because of fuel starvation. Mostly this happened in high angle of attack situations shortly after take-off. The wings have no dihedral which makes the fuel pick-up a little trickier. If you build the fuel system according to the plans, run fuel flow tests on the ground and don’t take off with little rest fuel in the tanks you’re safe. Some insurer ask for a header tank because of reported accidents. Refer to the fuel system section for more information. Q: There seems to be some discussions over the structural stability of the wing spars. Is this of concern? A: It is of concern if you build the longer wings with the original spars. You can either lower the gross weight to i.e. 2,200 lbs or buy the “Super Tube” fromDream Aircraft. Note that there is no reported case of an in-flight failure of the wing spars after 20 or so year of using this system. There are also planes with long wings and original spars that have been flown for more than 10 years. Refer to the back issues of the newsletter and the online discussion. Q: Where can I buy the plans? What additional information is available? A: The plans are sold by Jim Bede (www.bedecorp.com). There is also a book. The book contains most of the plans (in a smaller scale) and is generally sufficient to build the plane. There are differences between the plans and the book. Refer to the revision page for more information. Q: Why is the BD-4 so fast and fuel efficient? Where is the catch? A: The catch has to be the size of the cabin if you compare it with other (real) 4-seaters. This keeps the frontal area small and thus the drag. However, for a 2+2 seater you’ll find the cabin surprisingly spacious. The low drag wing profile makes for a fast cross country machine. The approach speed is higher than that of a Cessna 172. It seems not advisable to put a BD-4 on floats. Q: What are the dimensions of the cabin? A: Width=42 in., height= 41 in., length=98 in. Q: I’ve heard about a small and larger tail (vertical stabilizer). What is the difference? A: The first BD-4s had a smaller vertical stabilizer with a split rudder where the rudder did not go all the way up to the tip of the stabilizer. In 1970 the Bede Corp. came out with an ‘optional’ design improvement, the ‘larger tail’. This address the (for some pilots) inadequate rudder efficiency and directional stability (see additional information).